Every dollar contributed will help bring a cure that much closer. a leading contributor in the effort to cure all auto-immune diseases. Net proceeds will be donated to the American Autoimmune Related Diseases Association, and Dr. Faustman’s lab. dinner and on course beverages. Reserve your foursome early - There will only be 30 reserved tee times. Payment must be received by June 1, 2019.
to the extent it exceeds value received. All other contributions are fully deductible. For over a decade, the Brave Dave Foundation has been a leading contributor in the effort to cure all auto-immune diseases. Founded by Dave Gearing who has battled multiple sclerosis for nearly 30 years, the foundation has grown to be a year-round charitable organization. Through its sponsorship of golf outings, book fairs, crab feasts and other events, the foundation has contributed over $400,000.00 towards finding a cure. At the same time, the Foundation has educated the public about the pervasiveness of auto-immune disease in American society, the cost of treatment, the proximity of a comprehensive cure and the benefits we all will experience as individual cures are found. Mr. Gearing grew up in Montgomery Village and was an avid school boy golfer on the Gaithersburg High School team, having groomed his game at the Montgomery Village Golf Club. Over his high school and college years, Gearing held several positions at the local golf course ranging from greens keeper to bartender. After graduating from law school Gearing was afflicted with Multiple Sclerosis and was forced to retire from the federal government several years ago. "MS research is at a critical juncture and anything I can do to help move the research along helps me and others suffering from MS," said Gearing. "As one of the first people to play Montgomery Village, I can tell you that not only will we be doing important work but everyone who participates will have a good time for a great cause." Gearing hopes to raise $10,000.00 to support the National Multiple Sclerosis Society. In exchange for their entry fee, golfers will receive an embroidered golf shirt and hat as well as assorted other gifts and be hosted by Gearing at a barbeque dinner after completing their round. In addition, all golfers will have a chance to enhance their winnings or to receive other prizes through challenges presented to them on various holes. "Every dollar contributed by the golfers will help bring a cure that much closer," Gearing emphasized. 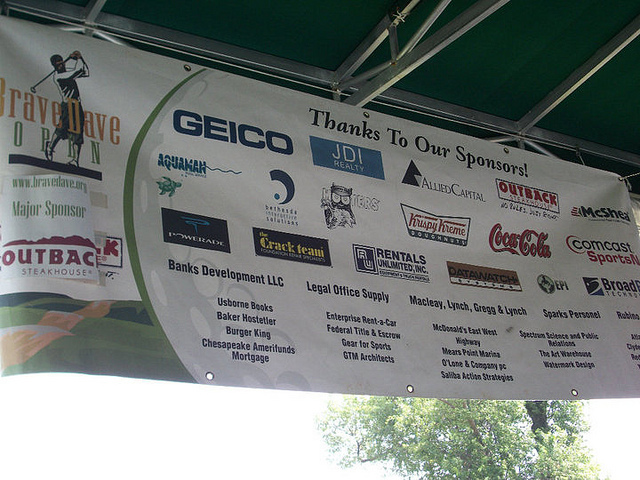 Many businesses in the area are sponsoring individual holes around the course. In addition generous support has been received from friends of Mr. Gearing. Gearing's intention is that the tournament will occur annually and that the tournament's contributions to MS research will increase as the years go by. Our foundation’s success in no small part comes as a result of its partnership with its major sponsors GEICO, Outback Steakhouse, Chick-fil-A and Usborne Books. These companies, like many of our business partners, have joined with Dave in part to help him achieve his goals and in part to support their employees and their families, many of whom know first-hand the pain and, up to now, hopelessness of dealing with any of the over 100 auto-immune diseases. By joining with the Brave Dave Foundation, our partners and contributors have placed themselves in the forefront of one of the great and winnable medical challenges confronting our nation. Your company or organization should join Dave in this battle. By doing so, you will significantly add to your outstanding history supporting charitable causes within our community, broaden your exposure to a large but not yet targeted segment of the Washington area, and provide valuable assistance and education to your employees and their families who may be afflicted by an auto-immune disease. More importantly, when a cure is found, you will be numbered among those leaders and researchers who dramatically improved the lives of over 40 million Americans.